You want Orgrimmar? You got Orgrimmar @ 7:42PM Friday night. 10 Boxing Test in Orgrimmar on Kil'jaeden. 60FPS and having the FPS erratically jump around. included a custom window swapping macro that increased swap times, this video did not. feel like manually fixing while FRAPS was eating away at HDD space. Well you are at good effects, and 30 fps max but still the gpu dosnt seem to be stressed to much. You do drop to 20ish fps when loading a lot of new characters (like when you first run out of the enterence). And it is far from clear if you would get more then 40fps if you were unlimited. But no matter there seems no lag or stuttering and the game is very playable at anything over 20fps and even down to 10fps, as long as there is no lag or stuttering. I didn't take into account that your cpu had to do fraps and stuffs so ya the cpu seems more then strong enough for the job and any fps loss is on the gpu I would think. Ya the switching is excellent, as good as mine. Mine dosn't mess up the screen though but thats nothing. 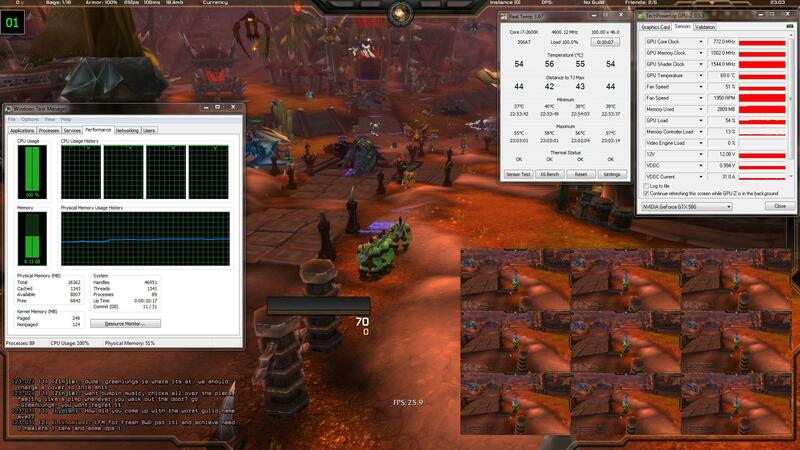 It is really amazing that you are rendering 10 screens at 1920 X 1080. The 9 alts are also at good efffects? I really don't think I miss anything by not tileing, maybe you drop aoe targeted spells a lot better though, but outside of that the screens are just to small to be really usefull (even considering you put the 9 on another monitor). I would think for 4 though tiled on a seperate monitor you could see a lot more. Still overall there is no question you can easy 10 box with your system, and that you have the best video card at under $550 for the job. Any more spent would have just given way to small return for the $. and essentially free up 45 FPS of CPU/GPU for even more main window performance. even recording at all, the CPU would have much more headroom. Thank you for your donation in the name of multiboxing science! break from school here in the next few weeks I can bust out some RIFT trials and see what I can do with that. Trion might actually have add-on support out by then which could make testing more interesting... we'll see. Sounds very interesting! I'm really kicking myself over not waiting for the sandy bridge chips and started building my rig last fall. I'm happy with it, but I could have saved quite a bit of cash knowing what I do now. I guess that's the nature of the beast though when it comes to technology. I've only pushed my i7 980x to 4.1GHz... But I always use a lot of caution with my hardware. (slightly faster than EVGA's OC) card that seems to hold it's own against the Ti cards. looking for the nVidia equivalent of the 6950 2GB, EVGA's GTX 560 Ti 2GB would be it. Good call, seems $50 cheaper then the 6950 also. There was a prior discussion (starts around page 3) on Intel's Hyper-Threading here on the forums and I just wanted to do my own quick test on a 2600K before my trials ran out on this 10 box setup. Video settings were identical from my 10 boxing Orgrimmar test run during all the screenshots taken. 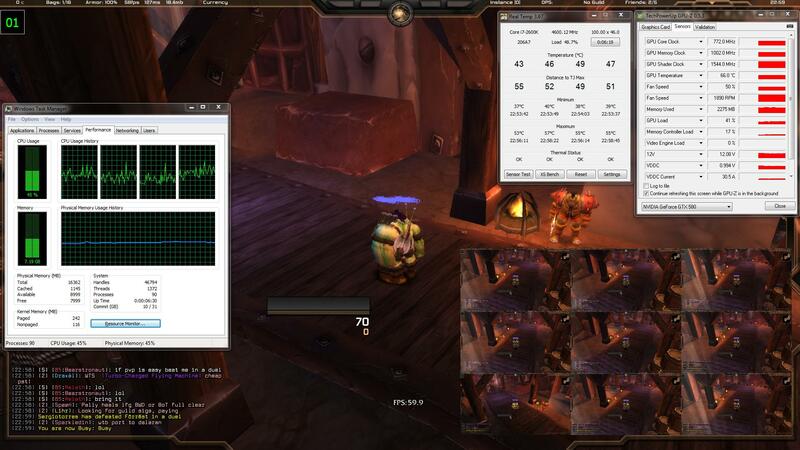 FRAPS is not running in this test and WoW is the only application which is using any CPU in all screenshots. Games were launched through Inner Space after a fresh system restart. I also did a quick check to see how much View Distance on the main client affected FPS and it did not see to be that large of an impact. I was really just double checking to make sure that View Distance did not affect the distance at which characters could be actually seen. I do realize that if the View Distance setting actually affected this it would be a major dis/advantage for people depending on the machine they were using to play. I always advocate that Hyper-Threading does not have a large impact on increasing gaming performance and that it has, at times, shown to actually decrease performance in certain applications. 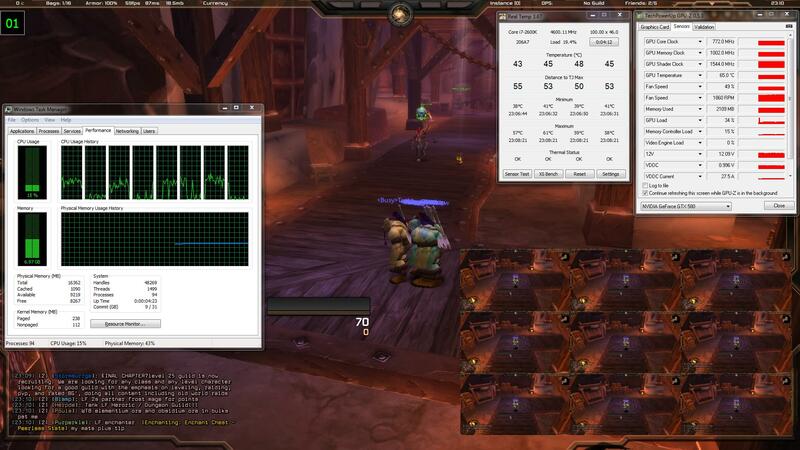 It does, however, happen to show a nice performance increase while 10 boxing World of Warcraft. I have yet to do a 5 boxing test. great to see this and interesting to see the limits..good for anyone in future wishing to try to 10 box..
it actually locked the wow fps to 30 fps when recording...of course this may have been an old version..and if there was an updated version this may not happen now..